President John Dramani Mahama and his Iranian Counterpart, Dr. Hassan Rouhani over the weekends addressed a press conference at the Sa'd Abad Palace in Tehran after a closed door meeting and bilateral talks. President Mahama, who arrived in Tehran on Saturday, was ushered into the Palace by a mounted horse squadron after which he inspected a guard of honour. The two sides held bilateral discussions and shared views on a number of issues before signing two Memoranda of Understanding on Cooperation on Standards and also on Agriculture. 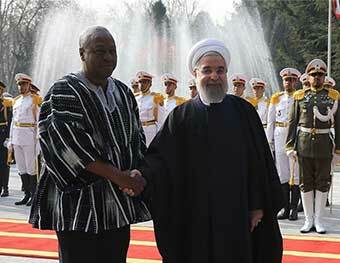 President Mahama is the first African Leader to visit Iran following the lifting of the UN sanctions on Iran. He is also the first sitting Ghanaian President to visit Iran since the Islamic revolution almost 4 decades ago. Ghana and Iran have a long standing relationship as members of the Non-Aligned Movement. In 2014, during a visit to Ghana by former Iranian President Mahmoud Ahmadinejad, the two countries established a Permanent Joint Commission.